Matthew's father owned a fishing boat. Every morning before sunrise he chugged out of the harbor, blowing smoke from the boat's chimney. Sometimes Matthew woke up early with his father and ran down to the dock to wave goodbye. One morning Matthew sat up in bed, wide awake. He looked out the window. The sun shone and birds flew through the azure sky. He'd slept in and his father had already gone fishing. After breakfast Matthew ran down to the dock to wait for his father to come home with his boat full of mackerel and cod. He stood at the edge, gazing into the water. On the other side of the bay stood the rest of the village. Matthew saw the old Norman castle, the church and a few houses. A boy stood on the grass looking towards Matthew. He waved. Matthew waved back. The boy sat on the grass and watched everything Matthew did. When Matthew's father returned, Matthew helped him unload his catch. As he worked on the boat, Matthew kept his eye on the other boy across the bay. 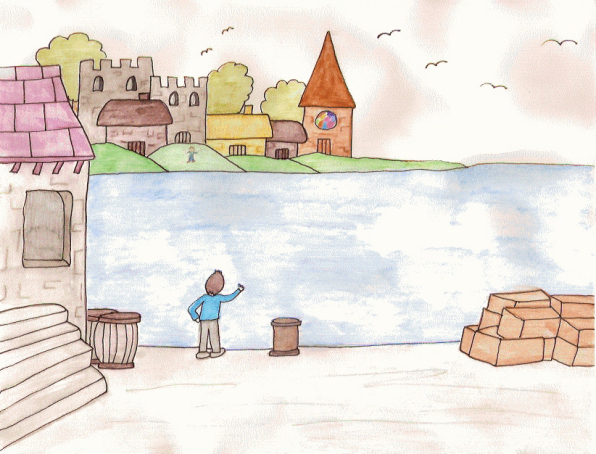 When he'd finished, he stacked crates of fish and carried it to the fishmarket with his father. The next day the same thing happened. Matthew went to the dock and the boy waved at him again. Matthew wondered who it was and why he just sat there all day. A few weeks later Matthew decided to make friends with the boy. Instead of going to the dock to wait for his father, he went into town. He passed the old Norman castle ruins, the butcher shop, the woolen shop and the library. He squeezed through between two buildings and saw the boy. His eyes went straight to the boy's leg. He wore a brace on it. Now Matthew understood why the boy sat there every day watching other people's busy lives. “I'm Thomas. I hurt my leg in an accident when I was three. I've been in this brace since then. It's hard for me to walk.” Thomas gazed out at the bay. Matthew told Thomas all about the village's history and about how his father went fishing every day. He learned that Thomas didn't have a father and that his mother and he were very poor. She works hard all day just to provide for Thomas. The boat chugged into the bay and docked. Matthew introduced Thomas to his father. “Thomas, why don't you sit there and you can roll up the fishing nets. That'd be a big help, wouldn't it?” He winked at his father. While Thomas worked, Matthew told his father about Thomas and his mother. That night Matthew helped Thomas back to his house and every day he went to the other side of the bay to help him come to work. Matthew's father paid him a good amount of money for his efforts and sent him home with haddock, cod, mussels, oysters, and crabs. Soon Thomas's mother was able to move into a house on the other side of the bay, very close to Matthew's house. Thomas could walk all by himself down to the dock. Matthew saw that Thomas was getting stronger because he was eating better and exercising. Even though he always limped, Thomas learned to walk for longer and longer distances. When he and Matthew were old enough, they both went out on the boat to help catch fish. Never again did Thomas or his mother do without, thanks to a kind boy named Matthew.